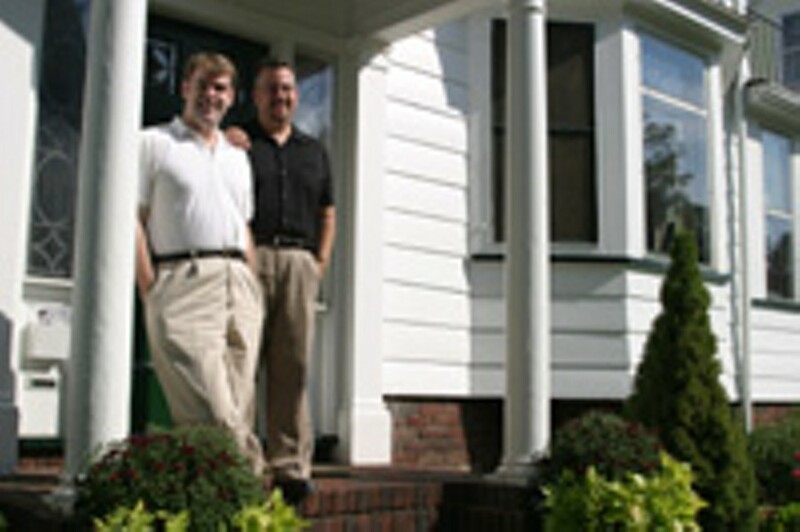 Photo by Matt Walsh The door will be open: J. Brad Benson and Carl Johengen outside their home, one of the stops on the 19th Ward House Tour. Not many people living outside the 19th Ward can understand why people choose to live there. Then there are the 19th-Warders themselves, a group that has adopted the slogan "Urban by Choice." Many of these folks are fiercely loyal to their corner of the city. And they sing the praises of its diversity. Barbara and Bill Sullivan are chairing the 19th Ward Community Association's House Tour this year. They have lived in the 19th Ward for 30 years. They love their home, but are familiar with the misconceptions about the neighborhood. "There's a big number of people in the community at large that are surprised that there are middle-class people who live in the city by choice and happily," Bill says. "They're surprised that you're white," he adds. The Community Association has held the annual House Tour, when a handful of residents open their homes to the public, since 1971. "It is among the most important things we do in the neighborhood," Barbara says. "It is one of the very best ways we have of getting the word out." Typically about 300 people come to the Tour. This year the Sullivans tried to gather a range of homes --- large and small, simple and lavish --- as well as a range of household types, levels of income, and races. "Because that's what the neighborhood is," Bill says. The 19th Ward is in Rochester's southwest corner. It is the city's largest residential neighborhood, with more than 22,000 people living there. It is also one of Rochester's most diverse neighborhoods, both racially and economically. And the homes accommodate that diversity: small cottages and large houses sit side by side. One thing you hear again and again from residents in the 19th Ward: they deliberately chose to live there. These are people who want the diversity, housing stock, and convenience of city living. Bill Sullivan thinks the diversity of the neighborhood is unique, and he credits it to neighbors working together. "The community association staked that turf out 40 years ago and said, 'This is what it's going to be,'" he says. The 19th Ward Community Association is the oldest continually operating one in the city --- it formed in 1965 to counter the threat of white flight. And it is particularly active, organizing events, celebrating the neighborhood's beautiful homes, and promoting the tight community that many residents say is what keeps them there. The Sullivans' son recently moved back to the 19th Ward. On the block where his house sits, there live five second-generation 19th-Warders. And that's just typical, they say. Once you live there, you never want to leave. But in the eyes of manyoutsiders, both suburbanites and other city dwellers, the 19th Ward is a neighborhood plagued by poverty and crime. "Certainly there's crime in the city," Bill Sullivan says. "You can't move away from problems in society. But we work to make our community a better place." The Reverend J. Brad Benson and Dr. Carl Johengen, who have lived in their 1930 19th Ward house for almost two years, agree. "You have to use common sense," Johengen says. When they first moved in some things were stolen out of their yard. But now they just put everything away. They came to the neighborhood because of the neighborhood. Benson had been looking at real estate online and saw a house that looked like a mansion in its virtual tour. "I came to the neighborhood, and the surroundings were just a gem," he says. The house wasn't as big as it looked. "But I thought, the house may not be exactly what I had imagined, but the neighborhood certainly is," Benson says. They joined the community association before they moved in. Benson and Johengen have a store of anecdotes about the kindness of their neighbors. When Johengen fell in the yard and sprained his ankle, he reached for his neighbor list and in no time there were people there to help. They adopted the tradition of hosting parties to introduce newcomers to their neighbors. People have parties when a new neighbor moves in, bring cake over, loan each other lawn equipment. "Those are the kind of stories you hear all the time in the 19th Ward," Johengen says. The 19th Ward Community Association's House Tour is on Saturday, October 2, from 1 to 5 p.m. Tickets ($8 in advance, $10 on tour day) are available at Creator's Hands, Hunt's Hardware, Parkleigh, Borders, and Wegmans. Info: 328-1916.